Stabiae, Off the Beaten Track But Worth It! Stabiae was a Roman town that got covered in ash by the eruption of Vesuvius in 79 AD. 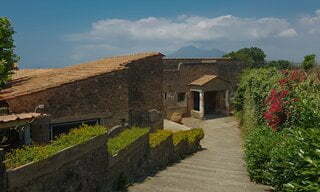 Now two of the villas (San Marco and Arianna) are part of the Vesuvian sites promoted by the Special Superintendency for the Archaeological Heritage of Naples and Pompeii. 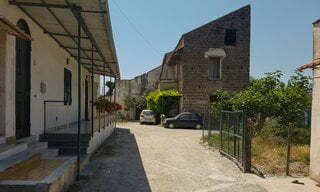 Look anywhere on the internet, however, and there are comments about how difficult it is to get to these villas. They nearly put me off! True, the villas are a bit out of the way. But it really is an easy route, on foot or by car. Follow these photographic directions, and I am confident you will be glad you made the effort. For the view of Vesuvius and the Bay of Naples if nothing else. View of Vesuvius and the Bay of Naples from Villa San Marco, Castellammare di Stabia. What is Stabiae, and why bother? Stabiae was a Roman port town about 5 kilometres southwest of Pompeii. From about the 6th century BC the importance of the port was overshadowed by the expanding Pompeii. In 89 BC the town was largely destroyed during the Social War, and thereafter the town became a seaside resort for wealthy Romans. Pliny the Elder wrote of several miles of large, luxury villas built on the headland, with spectacular views of the Bay of Naples. In 79 AD Stabiae was covered by ash from Vesuvius, and it was here that Pliny the Elder died attempting to rescue his friends. The first excavations were carried out by workmen of King Charles VII of Naples. Little is known of these excavations, and given the techniques that would have been used at the time the information we do have is not that reliable. Ruins of the ancient town were again encountered in the 1950s, and archaeological work has continued since. 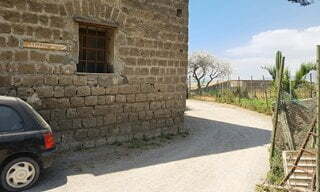 A number of villas have been excavated by two, Villa San Marco and Villa Arianne, are open to the public. As these villas belonged to extremely wealthy citizens, what we have here are some of the finest examples of any Roman villas. As it does take a bit more effort to get to them, you get to experience these extraordinary villas with very few other visitors. As the complexes are so vast, it is not unusual to get the feeling you are the only visitors. If you have a particular interest in Roman archaeology, you will not be disappointed visiting either or both of these Stabian villas. An atrium with well preserved if not complete Roman frescoes on the walls in the Villa San Marco. 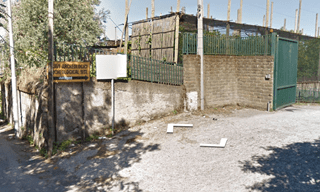 First you need to get on the Circuito archeologico vesuviano (Vesuvian Archaeological Circuit) line that runs between Naples and Sorrento. 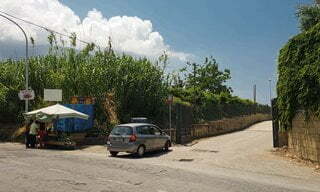 The stop for the archaeological sites of Stabiae is Via Nocera. 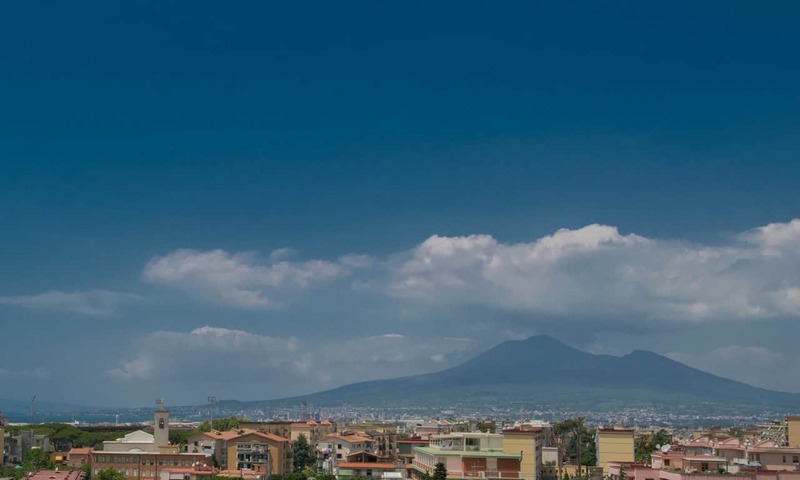 To give you an idea about time, it takes around 20 minutes from the Pompeii stop to Via Nocera, and about 40 minutes from Naples. 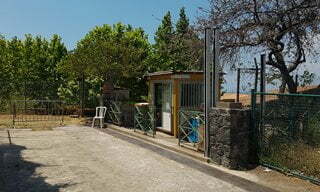 Villa San Marco is about a 30 minute gentle walk from Via Nocera station. The following photographs should help demonstrate how easy a walk it really is - the numbers on the captions correspond to the green numbered pins on the map. 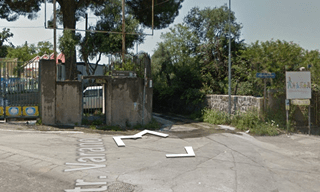 As you can see on the map, the two villas are just above the station, on the Varano Plateau overlooking Castellammare di Stabia. To reach the villas you need to walk along the base of the plateau, walk up a slightly inclining road and then come back on yourself to the villas themselves. You can only get off the train on one platform. 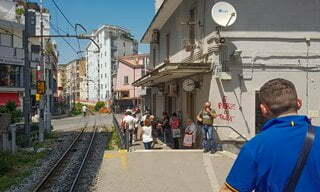 Exit the train, turn right towards the ticket office and then turn right on to Via Guiseppe Cosenza. 2. 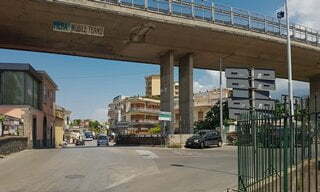 Continue along Via Guiseppe Cosenza until you reach the motorway above the road, about 15 minutes. Turn right. 2. As you approach this junction the signs pointing to the archaeological sites are facing the other way. 3. 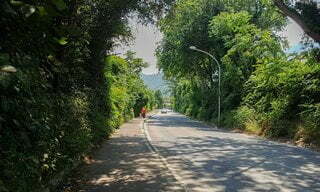 The start of the road up to the villas, here is is called Strada Provinciale Varano Scavi di Stabia. 4. On a hot day you will welcome the shade … for a few minutes. 5. About 15 minutes up the road you will see a sign, a small sign for the site. 5. If you are walking take the road on the left, if you are in a car, the car park can be reached by the road on the right. 6. Continue walking along that road for a few minutes. 7. At times you will wonder if you are in the right place, then you will spot the ‘entrance’ sign. 8. Turn the corner and there is the ticket office. The attendant will ask your nationality, and give you a guidebook (free). 9. Walk into the villa and enjoy! 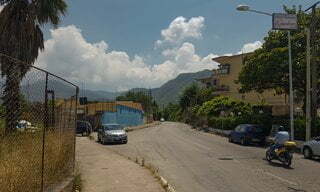 To continue on to Villa Arianna, go back to the main road and turn right. 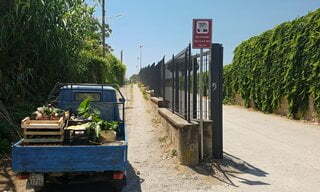 The road is now called Passeggiata Archeologica. The walk to Villa Arianna takes about 25 minutes. About halfway along the road there is a small shop that sells ice cold water. The perfect stop if it is a hot day. 10. 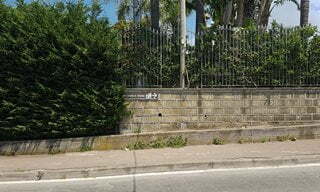 There is a sign on the wall opposite the entrance to Villa San Marco that indicates the direction for Villa Arianna. 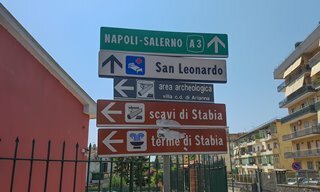 If you read about the Atiquarium di Castellammare, the museum where many of the artefacts from Stabiae are housed, its location is marked on the map above, unfortunately for some reason it is not open to the public. 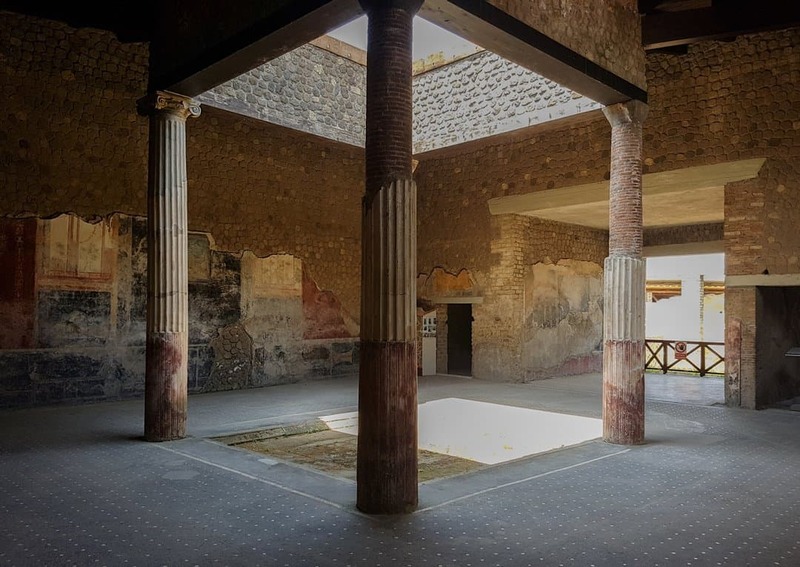 Read more information on and tips for visiting the Vesuvian sites of Pompeii, Herculaneum, Villa Oplontis and Boscoreale. If getting to the Stabiae villas still sounds a bit too daunting for you, get yourself a driver to take you or reserve a place on a small group or private guided tour. Many thanks for the directions to the two Villas.We visited today and your directions were very useful and very easy to follow. We were very impressed with the two sites and we thought how lovely they were and so much to see, and both free. First, thank you Tina for returning to the website to share your experience. We are always very happy to know the information we provide is useful, particularly directions. I am glad you agree the two villas are well worth a visit. Visiting at this time (end of October) must be bliss. When I visited in June, it was too hot really. But the villas provided a welcome break in the shade. Delighted you agree Kathryn, the two Villas are worth the visit. The frustration trying to find directions to these two sites is etched in my mind! So I was very pleased to receive your comment. Thank you for your kind words!